THE iconic status of Rip to River Classic legend Nick Wightman is growing, according to Ocean Grove SLSC president Steve Peatling, after he won his fifth title on 2 January. The Ocean Grove-based Wightman, 30, strode to victory in 32:47, to win 10km Classic and finished ahead of training partner Harry Smithers, who came second in 33:10. “It is great, he (Nick Wightman) is becoming a bit of an icon for our Rip to River Classic,” Peatling said. Wightman, who turns 31 this month, will race in the eight kilometre Mountain to Surf event in Lorne on Friday 15 January. He said he was yet to hit his peak over the 10km race distance. “I am still getting fitter and still getting better,” Wightman told the Voice. Dawnbusters 5km fun run winner Daniel Hutchinson finished third in 34:29, while fourth-placed Ocean Grove local James Dalton claimed his first top five finish in 34:43. “I was fairly happy with a top five finish, not over the moon with the time, but satisfied,” Dalton said. IN the women’s 10km run, Mornington Peninsula local Sarah Klein won her third Rip to River Classic crown. Klein, 30, who had won the 10km women’s event back-to-back prior to missing last summer’s Rip to River Classic, finished in a time of 37.22. Klein said the higher than usual tide made it a tough start for competitors at the 10km start point at the Point Lonsdale lighthouse. “We did notice at the start line the tide was in a bit further in than other years,” she said. 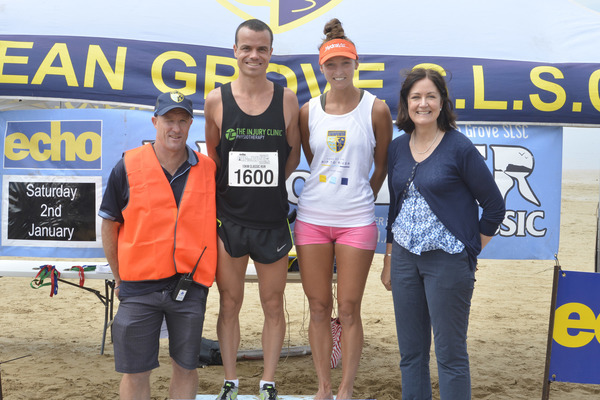 IN the 5km run, Brad Molloy won in a time of 17:41, while Patrick Matthews came second in 17:51 and Ocean Grove local Tyron Cover finished in third in 17:55. “I think it was the first time I ran under 18 minutes in the 5km, I was happy to get third,” Cover said. IN the 10km walk, renowned multiple winner Merryn Dawborn-Gudlach won in a time of 1:13:23. IN the 1.4km Ripper Nipper event, 11-year-old youngster Nick Bell won in a time of 05:03. UP to 1100 participants competed across both the 10km run and 10km walk and 5km run and the 1.4km Ripper Nipper race events. Ocean Grove SLSC Steve Peatling pleased with the turnout despite lower numbers in Ripper Nipper event, which coincided with Life Saving Victoria’s junior nipper state carnival at Torquay’s Cosy Corner. 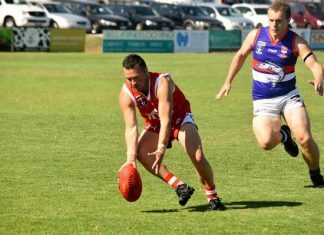 “With the clash with Cosy Corner carnival it is sort of what we were expecting anyway a number drop in the Ripper Nipper race,” he said. The annual Rip to River Classic is Ocean Grove Surf Life Saving Club’s major fundraiser. Federal Member for Corangamite, Sarah Henderson, who presented medallions to age group winners at the after race presentations, praised the Ocean Grove SLSC’s tireless work to help organise the Rip to River Classic. “Congratulations to the club (Ocean Grove SLSC) and to all the competitors,” Ms Henderson said.